Bang! Zoom! Let's go to the moon with new control schemes, an updated UI, and more. It’s an exciting time at Squad’s Mission Control facility as we are getting ready to launch Kerbal Space Program Enhanced Edition on PS4 on January 16. We’ve partnered with the talented and experienced team at BlitWorks to develop this new PS4 version from the ground up that includes a bunch of enhancements for performance, user interface, and all-new controller layouts to improve your experience playing the game. Additionally, the previous version of KSP was only available on PS4 in America, but we’re pleased to announce that PlayStation fans around the world can enjoy Kerbal Space Program Enhanced Edition! 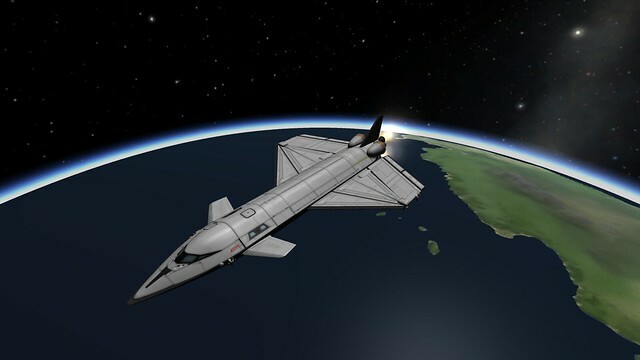 The main challenge in bringing a game like KSP from PC to PS4 is making sure the game is just as fun to play with a controller as it is with a mouse and keyboard. So in addition to putting in a lot of essential work on optimization to improve the game’s performance on PS4, we focused on finding the best way to map keyboard actions to a controller. 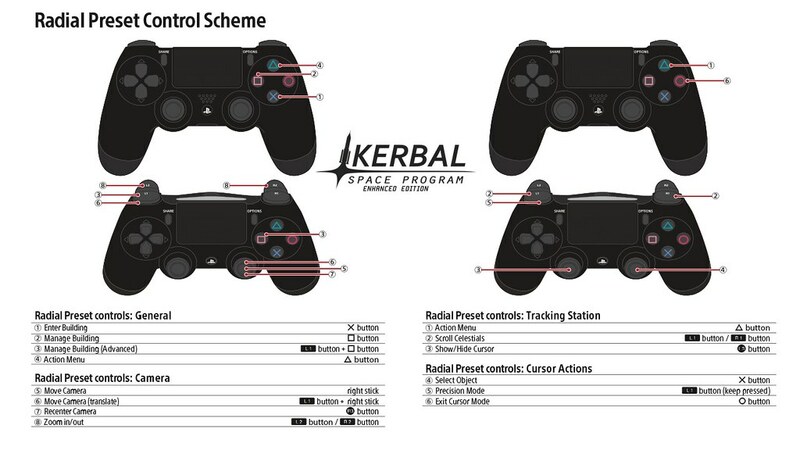 Returning KSP players on PS4 might have gotten used to the previous control scheme, so the Cursor preset keeps things familiar for veteran players while adding a few enhancements as well. We also created the Simplified preset, an entirely new control scheme designed to be easier to pick up and play with a controller. The UI was rewritten and we implemented region navigation and a “look-at” system that allows players to access all sub-menus and tweakables without the use of a cursor at all. With this control scheme, the cursor has been replaced with a reticle in the middle of the screen; players can move the screen behind the reticle, rather than moving the reticle itself. 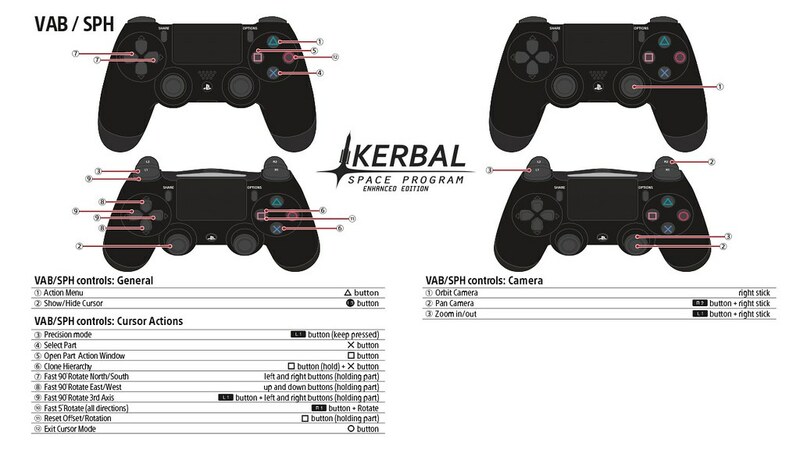 We think PS4 players who are new to KSP will especially enjoy the Simplified preset. For those of you familiar with KSP already, Kerbal Space Program Enhanced Edition is built from the 1.2.2 Loud and Clear release. 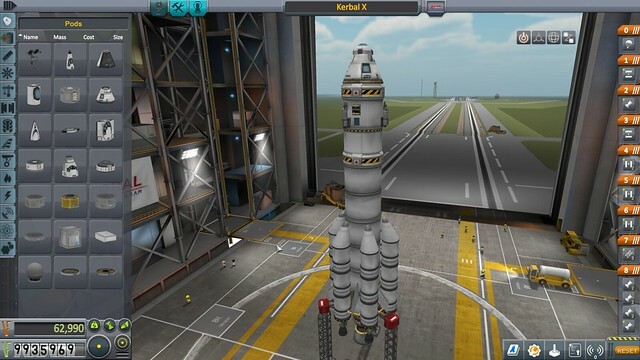 This means it comes with plenty of extra features and goodness in addition to the overall improvements on PS4, including new communication network capabilities between the Kerbal Space Center and launched spacecraft, an overhaul to the SAS system that assists your flight stability, and much more. Kerbal Space Program Enhanced Edition will be free for anyone who already owns the previous version of KSP on PS4. 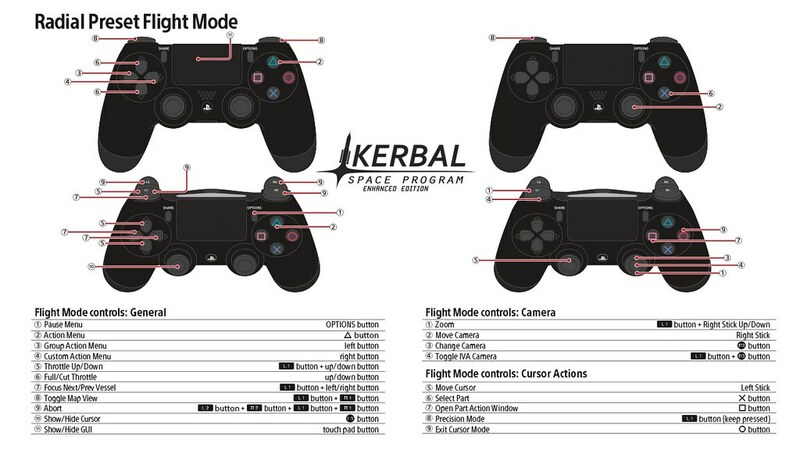 We’re excited to see all of you PS4 players in orbit when Kerbal Space Program Enhanced Edition launches next Tuesday. Nice, will there be a new trophy set? 1) Will there be a demo? 2) Any plans for PSVR support? Will there be a way to enlarge the text for us blind people? Hooray! I can start recommending this to people again! 1) Will existing saves be able to transfer to Enhanced Edition? 2) Are there any PS4 Pro enhancements? Any update for the broken version you already released and people payed for? This is great! My boys love playing this game but constantly struggle with the UI and making the controls do what they intended (we only have it on PS4). I am super thankful that you are making this a free upgrade to current owners of the game. They will be thrilled to get back into exploring space, and it being a lot easier to control while they are doing it! Thank you again! Is this a free update from our existing game, or an all new purchase? 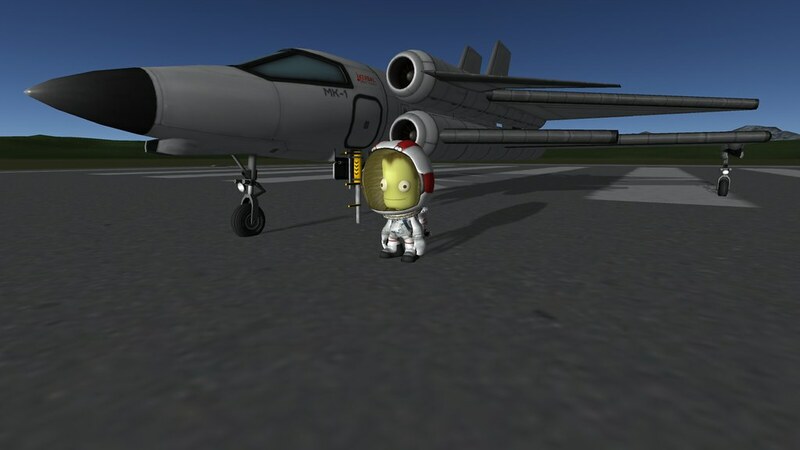 I was new to Kerbal and my friend kept telling me it’s an incredible game so I bought it when it was released but I found it to be tough to learn, and I never tried to play it after the first time I launched it. This sounds like a great edition. I hope it’s an update on my existing game so I can try it again. Dunno how i missed this, but thanks gang appreciate it. Hurray! I’m a huge fan of this on PC, but found the PS4 version impossible to play. I’m really glad to see that you didn’t forget about us and will be making it a free update. I can’t wait to try it out! Also looking forward to seeing a new generation of Kerbal players! This is super f*@king exciting for someone who has about 2,000 hours into the PC version. If you guys really want to grow this incredible game on PS4 I would suggest investigating a mod system the way Bethesda did with Skyrim/FO4. Also some sort of multiplayer would put it on another level. Question 1: I already own KSP do I have to download the enhanced version or just update the game? Question 2: If I have to download the enhanced version how do I convert my saves from the old KSP to the enhanced? Please enable mouse & keyboard! There is currently two bugs that need fixing. 1. When you launch a rocket and check the tracking station, it shows that your rocket is back on the launch pad. 2. After a few launches of planes, the throttle stops working. Extremely frustrating for a game that I really used to like. I’m not sure who you used to playtest the new controller schemes for PS4, but as someone who’s played flight simulators for over 20 years, including Janes USNF ’97, ATF, F-22 Raptor, Comanche, USAF, and recently, War Thunder, the controls are HORRID and completely counterintuitive. There are many places where it seems like the UI wasn’t optimized a PS4 controller. You would have done better to simply allow people to just customize every action to whatever button they want. And, as someone else already mentioned, KEYBOARD AND MOUSE SUPPORT for those who have them! !